Everton are the sort of side who are difficult for Tottenham to overcome, despite our good record against them in recent years. This has been over-turned in the last year or so, with the Toffees winning their first Premier League match at the Lane (followed by another this season) and under David Moyes, they have found a manager who has the knack of getting the best out of a group of players, who have very few stars among them. From Tim Howard at the back to Andy Johnson at the front, there are internationals throughout the team, but none of them are what you would consider as household names. The nearest they come to that would be Phil Neville, who is probably the less famous of the two brothers. He is a hard working midfielder, who sometimes covers in defence and while he can do a reasonable job there, his battling qualities are better off deployed in the Everton midfield, where he wins the ball and distributes it simply. Alongside him is the old (bald) head of Lee Carsley, who is a throwback to the "dogs of war" of the Toffees side from the past. A scrapper and a grafter, he does the legwork for the likes of Mikel Arteta, who embroiders the midfield with his passing and his abilities from the dead ball situation. He is a player who will need to be watched and one who might seek to exploit the zonal marking system Spurs employ from set-pieces. Also in the midfield would have been Tim Cahill, whose energy makes him a player who is very hard to pick up, but he is suspended. With Leon Osman in and out of the side this season, his effectiveness has been limited, but, like Cahill, he can hurt you when allowed space to shoot or run into the area. Manuel Fernandes' return to Goodison Park will be welcomed by the fans, as he has talent to please them, but he also has a less than committed attitude to the work ethic that Moyes demands and this might mean that he could be restricted to cameo appearances. 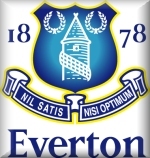 With the athletic, but sometimes badly positioned Tim Howard in goal, Everton also have the promising German Stefan Wessels in goal, but he has made mistakes in his limited number of performances in the Everton goal. The defence is picking itself at the moment with injuries and absences because of the African Nations Cup. Tony Hibbert might have returned to allow Neville to push up into a midfield berth, but he is suspended, but Alan Stubbs and Joleon Leescott will be pairing up in the middle of the back four. Former Sheffield United defender Phil Jagielka has taken a while to settle in at Goodison, but he is putting in some good showings now, although he might get caught out for pace up against Aaron Lennon. The front line will be missing Yakubu, but with Andy Johnson and Victor Anichebe likely to be paired up front, the Tottenham defenders will need to be on their toes. With Johnson having a low centre of gravity and a turn of pace, he blends well with Anichebe, who has strength and a bullish attitude that might try to unsettle the Tottenham back line. James Vaughan is on the sidelines if needed and his recovery from injury will be a welcome boost for the home fans, who had great hopes for him before a string of injuries struck. Moyes will line Everton up in a 4-4-2 formation and Ramos will probably match that, with some players being rested after playing against both Arsenal and Manchester United, but with Woodgate coming into the club, he could make a quick debut, with Dawson now being suspended. The Tottenham attacking options are once more limited as Bent is only just coming back to fitness, while Bale is still missing on the left, although Malbranque has done a fine job there in his place. After Sunday's good performance, it will be necessary to get Lennon into the game more to commit players on the left of the Toffees defence. Jenas might be given a rest ahead of the United rematch and with a reshaped team, I think we might most likely get a point, perhaps two if we can move the ball well enough on the night. At long last Spurs were involved in an uneventful match which saw no goal and little excitement, as they came home with a point from Everton after a rare 0-0 draw. With little else to get worked up about, it was Jonathan Woodgate's strong defensive performance in defence that won applause, while Pascal Chimbonda was the one who was a target for home fans and he got the bird from them. Chris Gunter was drafted in at left back, while Tom Huddlestone was deployed in the centre of defence once more and he put in a very good showing. In the early stages, Woodgate was head and shoulders above young Everton forward Victor Anichebe. The new Spurs signing won a lot in the air and he also showed that he was capable of blocking shots and runs when the ball was on the floor. As Tottenham continued to give away free-kicks around the penalty area, Woodgate had plenty of practice in heading the ball away and it looked as though Everton's best chance of scoring might come from a set-piece. Nuno Valente got perhaps one of the biggest cheers from the Toffees fans when he stuck one on Chimbonda and got away without getting a caution. But then we should have guessed, because after the performance by referee Andre Marriner in the game at home against Fulham on Boxing Day, I had hoped that he would not be officiating on our games again. No such luck ! Cerny fielded everything shot at him. He easily caught a curling effort from Baines and dived to keep hold of Andy Johnson's volley on the turn. Howard plucked out a home-made overhead kick by Steed Malbranque at the other end, while just before the break, Berbatov got the ball presented to him by captain Phil Neville and wasn't able to get a shot away. In between Johnson fell in the box ... no change there then ... but for once, the ref got it right, because although Hud's knee caught his trailing leg, it was a pure accident. With the Spurs crowd in good voice, singing songs of going to Wemberlee, while Everton lost out in the semi-final to Chelsea. The home crowd had been silenced by the Spurs performance in the first period, with the most often noise coming out of their areas of seats being the groan. They started the second half well, but the Arteta cross from the right wing flew at knee height across the front of the goal, with nobody there to apply the goal touch. Berbatov might be due for a transfer window move to Goodison Park, as Neville kept providing him with the ball and when he played it this to to Robbie Keane, the Irishman could only cut inside to try a tame shot that Howard caught easily. At the back, Gunter was having a good game and he looks a little leggy, but he has pace and seems aware of where he should be on the back line, before he was replaced by Kevin-Prince Boateng. Another youngster, Jamie O'Hara was doing a good job in midfield, tracking back instead of his normal attacking game. It was a side that had been thrown together a bit, but they knuckled down and worked hard for each other. Cerny was holding his end up with a brave rush out to deny Johnson, who was put in by Anichebe and shortly after, Tommy got his body in the way of a shot from Lee Carsley that flew off him for a corner and then did the same to Anichebe. When Boateng came on, he seemed to inject a bit of tempo into the Spurs game and some short passes got the team moving forward. However, Carsley was driving his won sid eon and he got on the end of a cross to put a header over and then tried a shot from way out that went way over !! Kevin looks like a player who can pick out a pass and when he threaded a ball through to Aaron Lennon, the winger put in an early ball for Berbatov to control and shoot, but Jagielka managed to get something on the shot to take the sting out of it. Similar to Everton's claim in the first half, Joleon Leescott tried to get a foot in on Steed Malbranque on the edge of the area, but only succeeded in stamping down on the Spurs man's foot. You see penalties given for it, but you do for what Huddlestone did in the first half too. On this occasion, the official waved play on again. As the game drew to a close, Spurs found the pace of Lennon a potent weapon to hit Everton on the break. He produced a cross from the right wing onto Dimitar's head, but he could not control the header and Howard took the ball without any trouble. He brought a foul from Valente, who had already been booked and should have seen red, but the ball ran on to Malbranque, but the midfielder's pass to Berbatov did not have the requisite weight and was picked off. Then in the very last minute of added time, he raced away and with him and Berbatov in attack against two defenders, he passed to the Bulgarian, but he was unable to get around Jagielka, who robbed him and the ball came off the striker for a goal-kick. A point at fourth placed Everton looks a good return on paper, but with the game lacking many major influential players and some of those who did play (i.e. Jenas) looked tired, leaving the game a shadow of what it might have been. However, both teams suffered with absences and both teams settled for a point at the end of the game. Tottenham's pluses came from those players who were new to the team or new to their positions. O'Hara and Gunter did well enough to justify Ramos' faith in them. Woodgate showed he can do a job for Spurs, with him taking turns with King to play alongside Dawson I would imagine. Huddlestone playing alongside Woodgate looked comfortable in that position and his size and passing make him an asset in defence. Promising signs, which need to be turned into reality by magic Juande. Starting on Saturday then ?? Read the Times Online by clicking here for Wyart Lane's review of the night's inaction. This must be one of the worst games and the worst Spurs performances in quite a while. Not just because there were no goals, but because the team looked poor against a decimated Everton side, when we might have got something out of it. With a lot of players rested or not being played, it did make you wonder if there were some of them with half an eye on a move out of the club. As far as the result went, it would have been a good point had it not gone the way it did and it really showed how useful Lennon's pace is as a weapon against Premiership defenders. Valente was crude and cynical in his "tackle" on the winger at the end, but given more time up against him, Aaron could have profited from the player being on a yellow card (even though this ref didn't look like he was going to send anyone off) and the fact that Aaron had the legs on him every time he went at him. The final ball produced by a lot of players tonight was lacking and Aaron is improving in that respect now. If we can get him in the game enough, he has the speed to worry many a full back and if they double up on him, it should allow someone else space to make use of. Let's hope it was a useful lesson learned from the bore draw.